For the second year in a row, Topps offered an updated box set to reflect the season's roster moves. 1982 Topps Traded Baseball has one of the best baseball cards of the decade, which carries the rest of the set. 1982 Topps Traded Baseball begins and ends with Cal Ripken Jr. 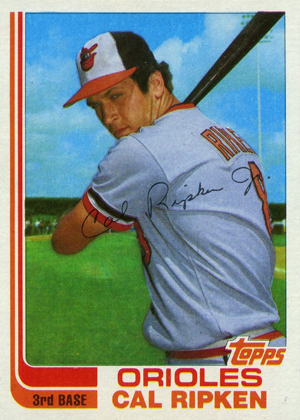 Although it's not a true rookie (Ripken appears on a Future Stars card in 1982 Topps Baseball with two other players), many collectors prefer the look of his first solo Topps card. 1982 Topps Traded was also tougher to come by. The set was sold by early hobby dealers. Other than Ripken, the other big cards in the set are of veterans Ozzie Smith and Reggie Jackson. The Smith is his first Topps card showing him as a member of the St. Louis Cardinals. Like Ripken, most of the "rookies" in the set had cards in 1982 Topps Baseball. As a result, there are only a couple of rookies in the set, none of which carry much clout. 1982 Topps Traded Baseball keeps the design elements of the flagship set. The biggest change is that the numbering is reset and runs 1T through 132T. 1981 Topps Traded Baseball continued the numbering from the basic set. 1982 Topps Traded Baseball U PICK Mint Set Free Shipping!!! 132 cards. Distributed as a factory set. Here are the top 5 deals on hobby boxes currently listed on eBay.